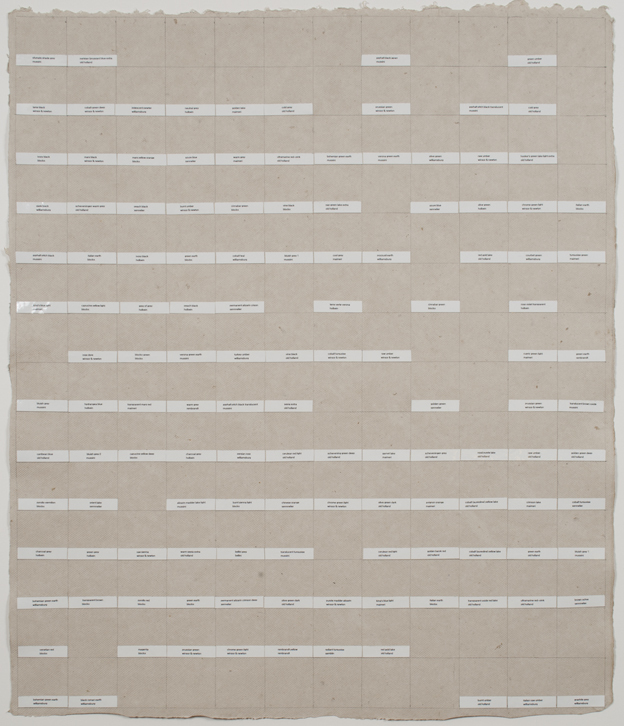 Memory drawing (John Cage and Merce Cunningham) is part of a drawing series that forms a counterpart to Haynes’s autobiographical color chart paintings. The autobiographical paintings and drawings appear to engage with two major formal preoccupations of the twentieth century: the grid and the monochrome. Yet to read Haynes’s color charts exclusively in terms of their relationship to art history overlooks their more private “sentimental” meaning. Haynes refers to this recent body of work as “sentimental conceptual art”: conceptual statements that are simultaneously poignant reflections of her own work. According to Haynes, the autobiographical color charts are deeply personal; the colors and paints trigger memories specific to her own use of them. The “memory drawings” transcend the intimate and the personal, however, by forcing each viewer to reconstruct the colors in his or her mind. Thus, the “memory drawings” are poetic reflections of both Haynes’s private experience as an artist, and of the process of making and beholding art. Haynes began to create the “memory drawings” several years ago in Colorado, where the climate prevented her from working in oil paint. She turned to text as a mnemonic stand-in for the colors that filled her paintings, incorporating small printed labels bearing the names of paints and their manufacturers. The drawings also differ from their painted counterparts in that they pay homage to specific artists who have inspired Haynes. She is particularly attracted to the spirit of artistic experimentation that she feels characterizes the 1960s, and the majority of her touchstones are well-known artists such as John Cage, Merce Cunningham, and Agnes Martin—to whom she dedicates another memory drawing. Haynes also devotes a drawing to Marcel Duchamp and chess. In speaking of her autobiographical color charts, Haynes invites another textual analogy, likening these works to the “table of contents” of her life. By sharing her table of contents with others, Haynes builds upon the generosity of her artistic forebears, offering her own thoughtful meditation on the joys of viewing—or “reading”—art. 1. Nancy Haynes, in discussion with the author, 29 June 2011. 2. Pamela Lee, “Jasper Johns: Wilderness I (1963-70)” originally printed in Drawing is another kind of language: Recent American Drawings from a New York Private Collection, Pamela M. Lee and Christine Mehring (Cambridge, MA: Harvard University Art Museums, 1997), accessible at http://www.aboutdrawing.org/essay/view/53. 3. Nancy Haynes, in discussion with the author, 29 June 2011. Nancy Haynes (b. 1947, Waterbury, CT) has exhibited in the United States and internationally since the 1970s. In 2000, Haynes was a Visiting Artist at Ohio State University, Columbus, a Visit Artist at Kent State University, Kent, Ohio, and a Visiting Lecturer at Princeton University, Princeton, NJ. Recent solo exhibitions of her work were held at Galerie Hubert Winter, Vienna, Austria (2002, 2006); Elizabeth Harris Gallery, New York (2009); George Lawson Gallery, San Francisco (2010); George Lawson Gallery, Los Angeles (2012); and 3A Gallery, New York (2012). Her work is included in the public collections of numerous major museums, including The Museum of Modern Art, New York; The Metropolitan Museum of Art, New York; the Whitney Museum of American Art, New York; the Brooklyn Museum, New York; the National Gallery of Art, Washington, D.C.; and the Museum of Fine Arts, Houston. She lives and works in Red Hook, Brooklyn, and in the Huerfano Valley, Colorado. More information about her work can be found at http://www.nancyhaynes.net. Elizabeth Donato (b. 1986, Abington, PA) is a doctoral candidate at the City University of New York Graduate Center, where she focuses on modern art and architecture in Latin America. Donato graduated with Honors in Art History from the University of Richmond, Virginia (2008). In addition to her studies, Donato is Adjunct Instructor at the City College of New York. She lives in Brooklyn. Nancy Haynes, in discussion with the author, 29 June 2011. Pamela Lee, “Jasper Johns: Wilderness I (1963-70)” originally printed in Drawing is another kind of language: Recent American Drawings from a New York Private Collection, Pamela M. Lee and Christine Mehring (Cambridge, MA: Harvard University Art Museums, 1997), accessible at http://www.aboutdrawing.org/essay/view/53.